Compact gaming miracle. 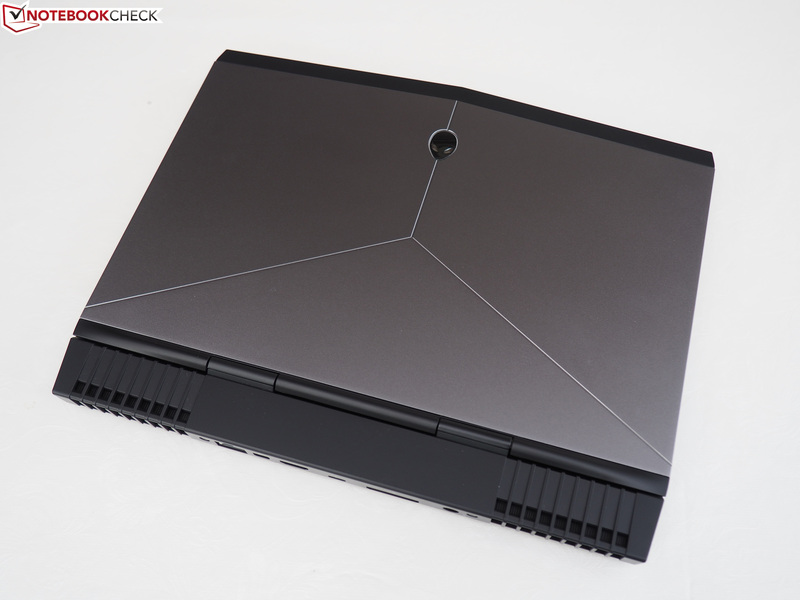 While our test model of the Alienware 15 R3 had some temperature problems, we are impressed by the 13-inch system. Besides the high performance in the small chassis, we are also convinced by the brilliant OLED screen. Even though there is a trend towards more portable notebooks with small dimensions, the choice in the range of smaller than 15 inches is still limited – at least when you are looking for a powerful gaming notebook. There are only two 14-inch laptops in our mobile Top 10 ranking (as of February), the MSI GS43VR 6RE and the 2016 model of the Razer Blade. Alienware or its parent company Dell now uses the concept of a mobile gaming system and takes it to another level with the Alienware 13 R3, the third iteration of the 13-inch gaming laptop. The technology has changed quite considerably compared to the pre-predecessor that we reviewed back in the mid-2015. The chassis no longer uses an efficient ULV processor with a TDP of 15 watts anymore, but a conventional quad-core CPU from Intel's Kaby Lake generation with a much higher consumption of 45 watts (Core i7-7700HQ or Core i5-7300HQ). The graphics performance has also improved. Instead of the Maxwell chip GeForce GTX 960M, the graphics are now handled by a brand-new Pascal chip. Depending on the SKU you will have a choice of the GeForce GTX 1050 (2 GB GDDR5), GeForce GTX 1050 Ti (4 GB GDDR5) or GeForce GTX 1060 (6 GB GDDR5) in combination with 8-32 GB of DDR4 RAM. Games and other files can be stored on an SSD with a capacity between 180 and 1000 GB (SATA-III or PCIe/NVMe). A secondary storage device is also possible. The definitive highlight turns out to be the high-resolution QHD display based on the OLED technology, even though it is a glossy panel due to its touch functionality. 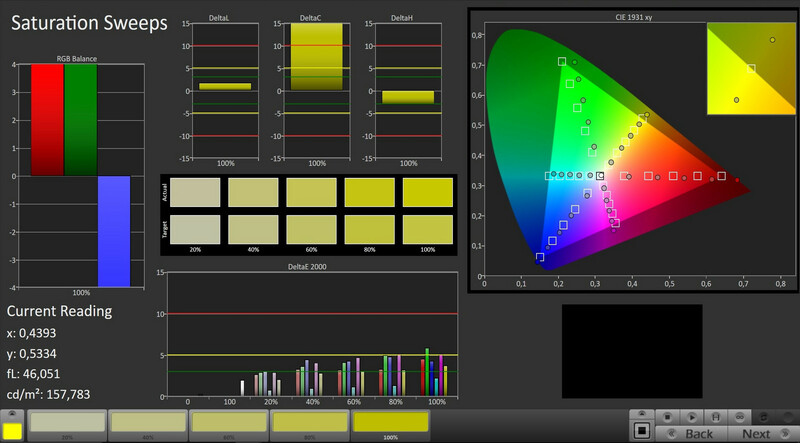 The less expensive models are equipped with "only" a Full HD IPS or HD TN panel. 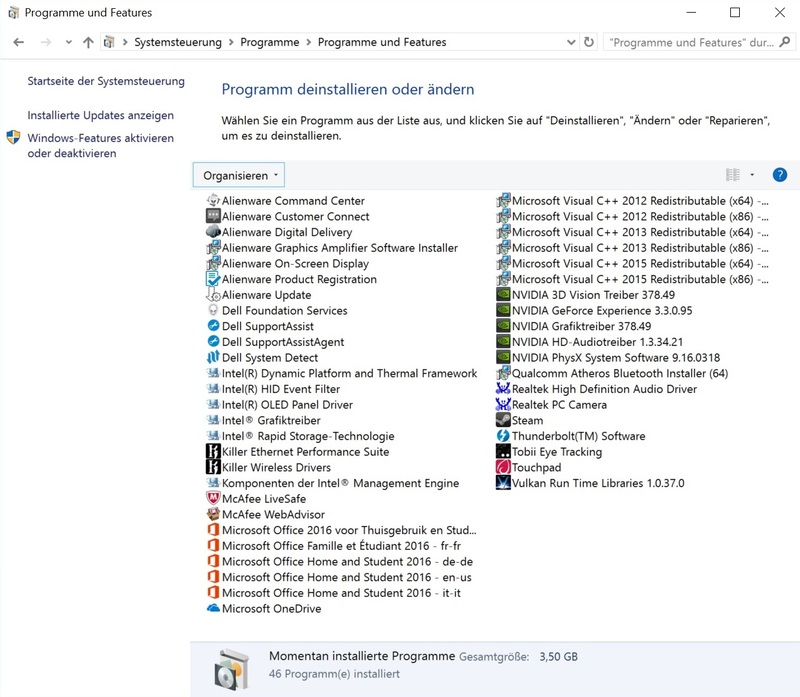 You can also build your own machine on Dell's website and adjust details such as the operating system (Windows 10 Home vs. 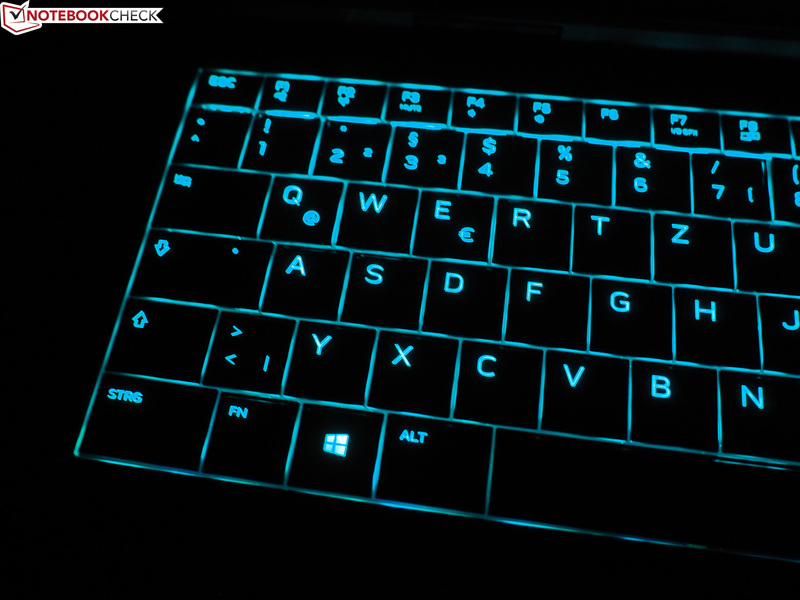 Pro), the keyboard layout (German vs. English) or the Wi-Fi module (Killer 1435 vs. 1535). We will cover different options for the software and the warranty later on. The entry-level model starts from 1479 Euros (~$1572); our test model is the high-end version, which currently retails for 2179 Euros (~$2316). Alienware follows its own design philosophy quite consistently, so the 13-inch system looks a lot like the larger 15 and 17-inch siblings. This has a lot of advantages, but also some drawbacks. 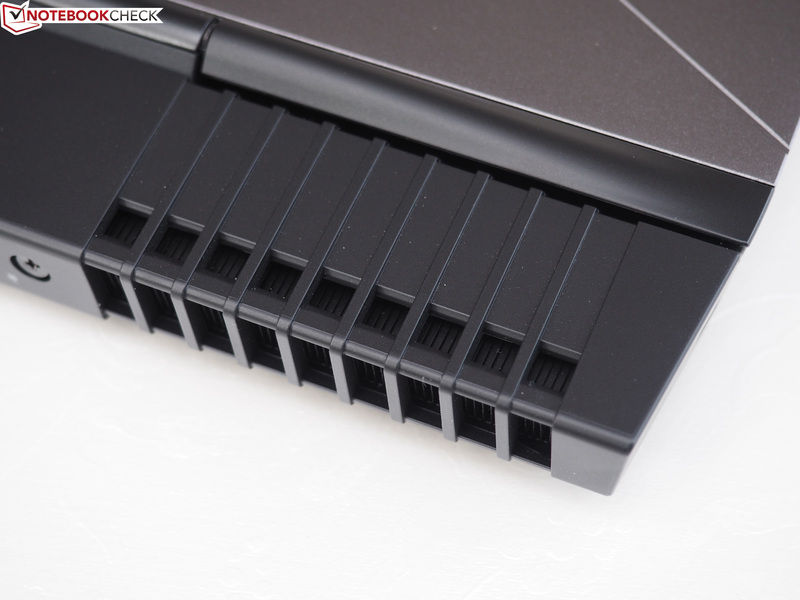 As with the Alienware 15 R3, the chassis is very slim at 2.2 to 2.4 cm (~0.87 to ~0.94 in), but the footprint is much bigger than you would expect from a 13-inch laptop because of the extreme depth (in this case 27 cm/~10.6 in). 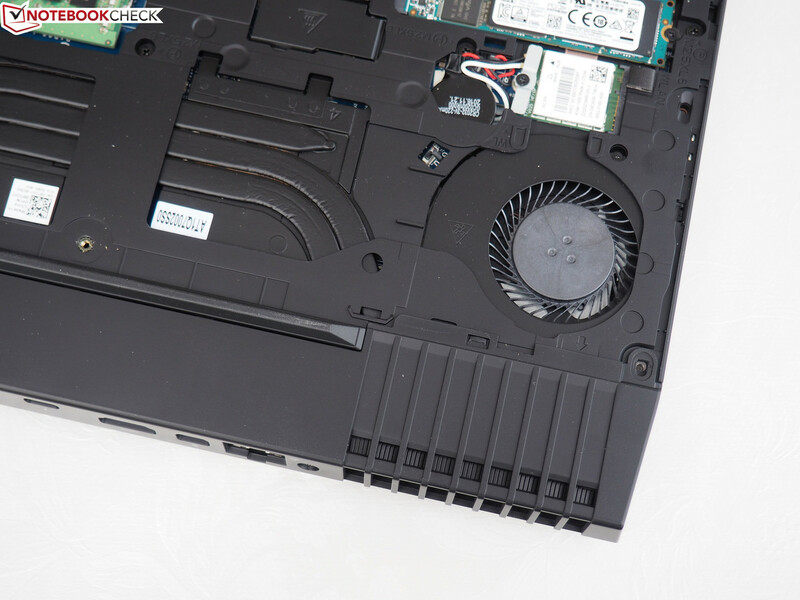 The lid is shifted by a few centimeters (see pictures) to improve the cooling of the high-end components. The "protruding rear" does not really fit the rest of the design in our opinion, which is excellent for the most part (although this is obviously a matter of taste). There is not much to criticize in terms of quality. Alienware once again uses a combination of metal (lid, bottom) and plastic, which is covered by a soft-touch finish in the area of the palm rests. The latter is very nice to touch, but – as per usual with rubberized surfaces – tends to attract dirt. 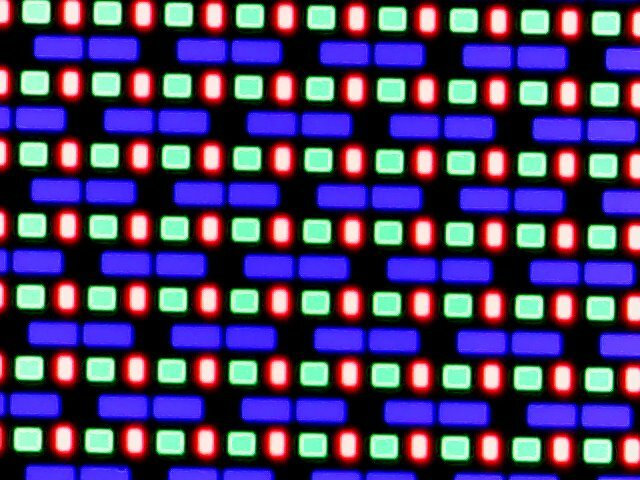 The most sensitive parts are the glossy bezels (OLED version). 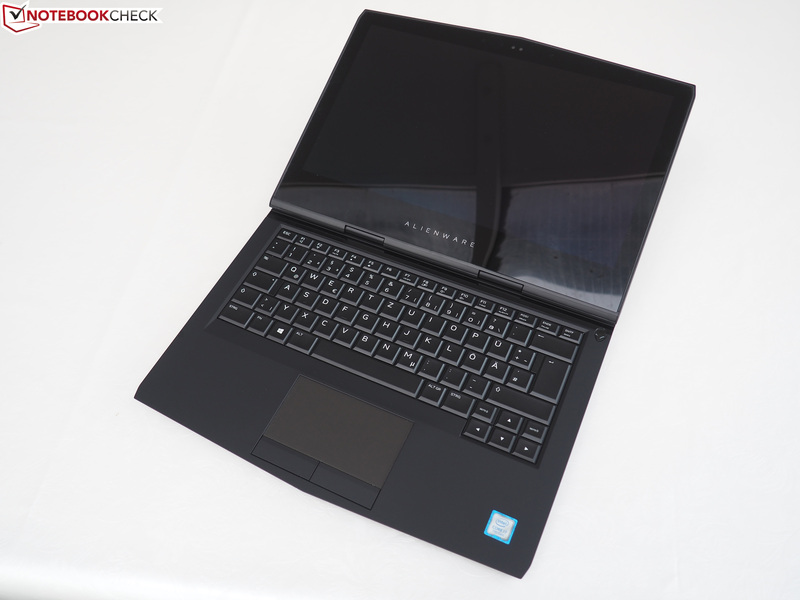 One of the best aspects of the Alienware 13 R3 is the excellent stability. It does not matter if you pressure the lid or the base, you can hardly warp or dent the chassis even with a lot of force. The quality is superior to most rivals, which is also the case with the lighting elements. In addition to the Alienware logo underneath the display and the two alien heads (cover, power), both the keyboard and the touchpad are also illuminated. 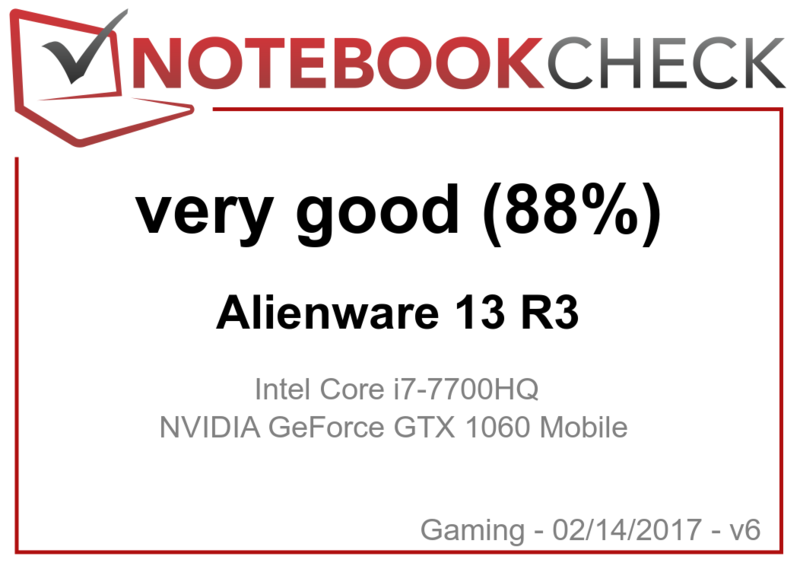 The Alienware 13 R3 is only average when it comes to weight. 2.5 kg (~5.5 lb) is not a lot for a gaming notebook, but there are more portable rivals. The Schenker XMG P406 only tips the scale at 2.2 kg (~4.9 lb), and the Razer Blade at almost exactly 2.0 kg (~4.4 lb). Both the MSI GS43VR and the Aorus X3 Plus v5 are even lighter at 1.9 and 1.8 kg (~4.2 and ~4 lb), respectively. The build quality is on a very high level, which is typical of Alienware. All surfaces of the test model have clean transitions and we cannot criticize the hinges either. Despite the pretty firm mechanism, which keeps the display well in position, you can still open the lid comfortably with one hand. Overall, we would describe the quality of the 13-inch chassis as unrivalled. Only the Razer Blade is on a similar level in the gaming segment. The port selection does not leave much to be desired when you consider the size of the notebook. 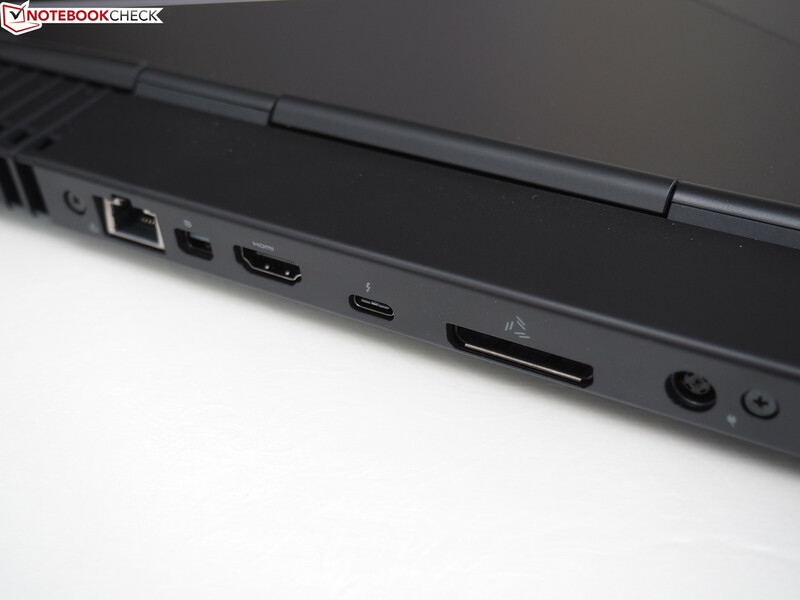 Alienware has positioned most of the ports at the rear, so you can use an external mouse on both sides of the chassis. Not only do you get two digital video outputs at the rear with HDMI 2.0 (4K @60 Hz) and Mini-DisplayPort, but also the power connector, RJ45 Ethernet as well as Thunderbolt 3, which also supports USB 3.1 Gen2 and DisplayPort. 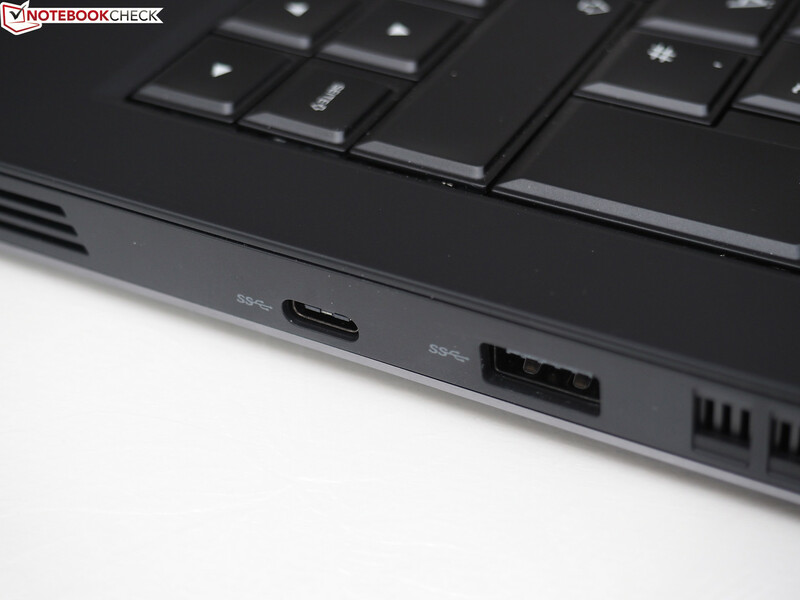 Then there is the proprietary connector for Alienware's Graphics Amplifier. This is an additional box for external graphics cards, which can improve the performance and replace the integrated GeForce GPU. Other eGPU solutions can be used via Thunderbolt 3. 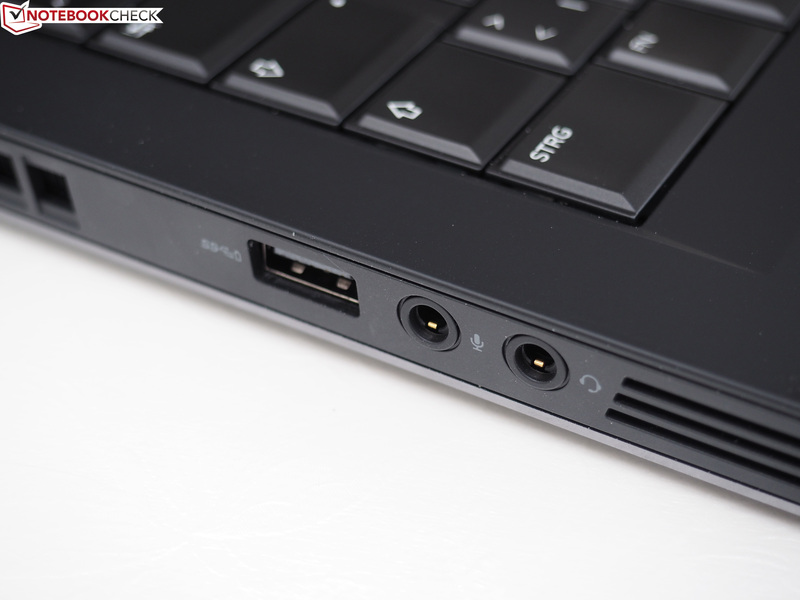 The Alienware 13 R3 also has enough USB ports. On the left is a classic 3.0 Type-A jack while on the right side a combination of USB 3.0 Type-A and 3.0 Type-C. Microphones, headsets and/or speakers can be attached via stereo jacks on the left side. We only missed a card reader. An optical drive is not available either, but we can understand that decision. 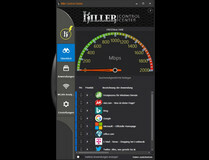 The Wi-Fi performance does not have to hide behind the rivals. 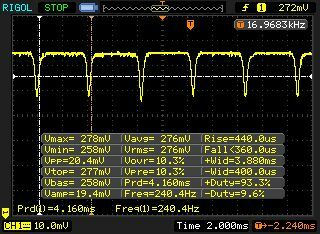 Average transfer rates of 571 Mbps (send) and 667 Mbps (receive) at a distance of 1 meter (~3 ft) are reminiscent of the Razer Blade, which is equipped with the Killer chip 1535 instead of the 1435. Both adapters support Bluetooth 4.1 as well as the WLAN standards 802.11 a/b/g/n/ac with a maximum transfer rate of 867 Mbps. The Gigabit controller (E2500) is also supplied by Rivet Networks. 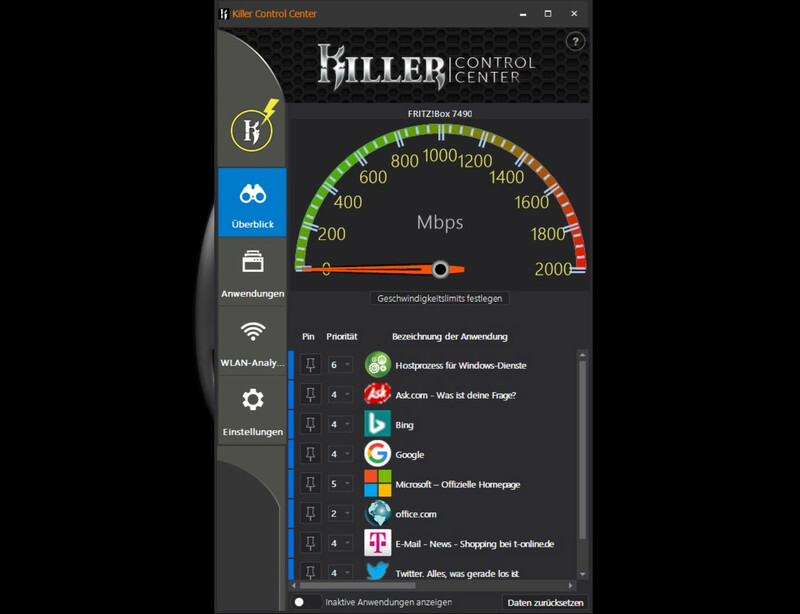 The preloaded Killer Control Center is a comfortable way to control and monitor data traffic. 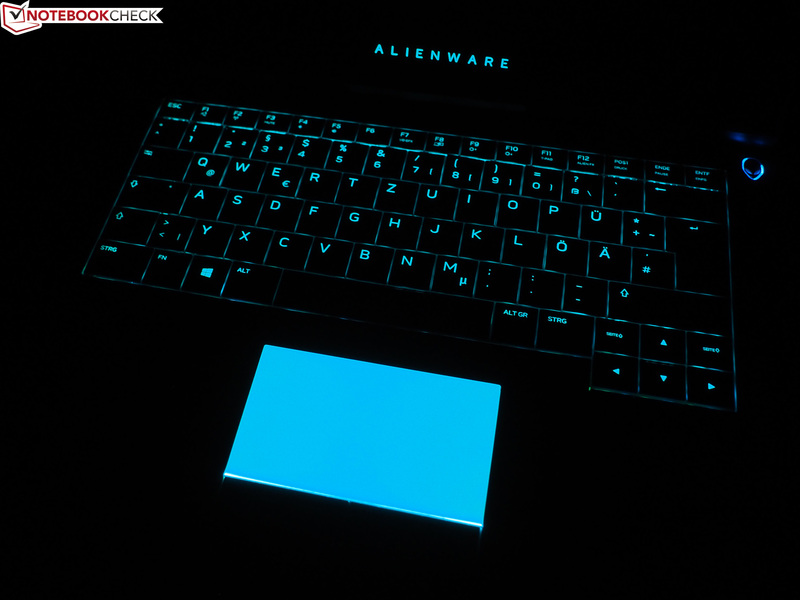 Alienware ships the laptop with only a quick-start guide and a 180-watt power adapter (660 grams/~1.5 lb). It is not a particularly small adapter with dimensions of almost 15 x 7.5 x 3 cm (~5.9 x 3 x 1.2 in). 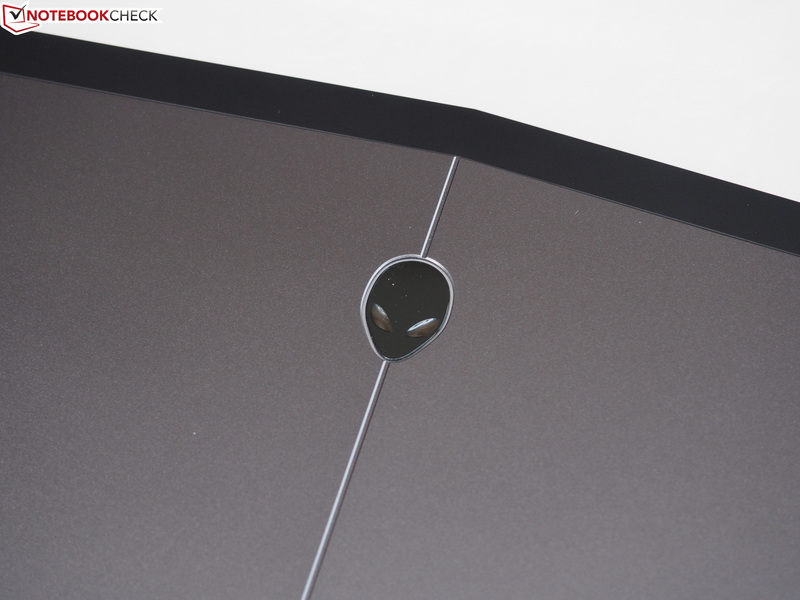 The maintenance options of the Alienware 13 R3 leave mixed impressions. Replacing or expanding the wireless module, memory (2x DDR4) or the storage drive (2x M.2 Type 2280) is comparatively easy. You can pry the bottom panel with some force after the removal of 5 screws and then replace the components. Accessing the cooling system and the battery is more complicated, because you have to dismantle the whole chassis. 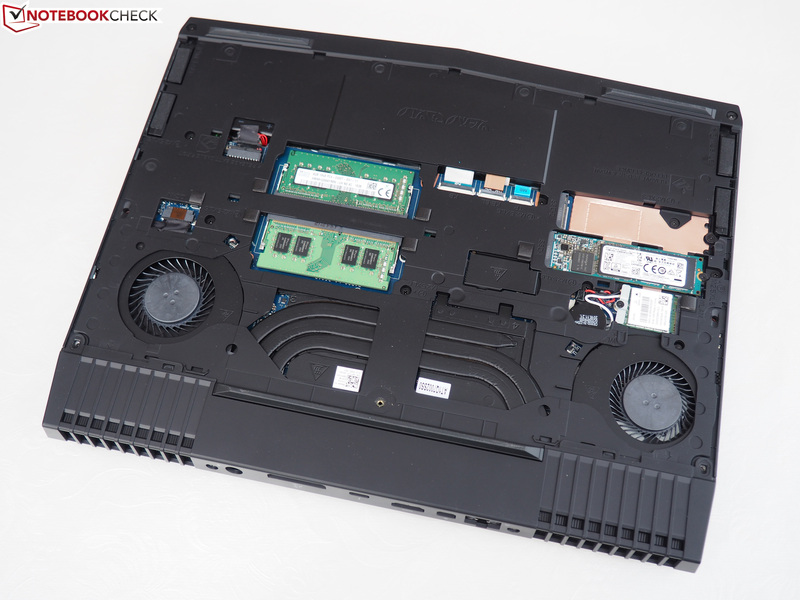 Unlike many other manufacturers, the laptop comes with only a 12-month base warranty. However, the homepage says it is a "Premium support with on-site service". It is possible to expand the warranty period to 2 to 4 years for an additional charge, and Dell also offers an optional support for accidental damages. 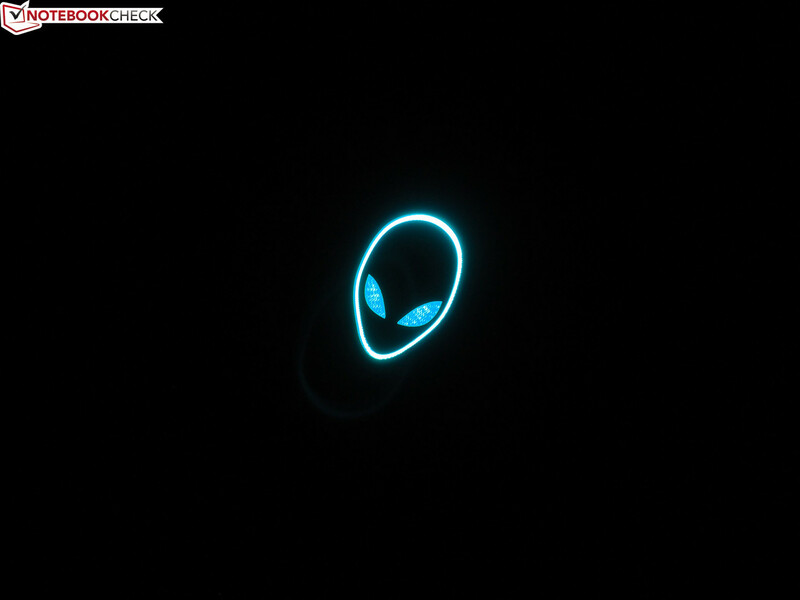 The tuning of the case lighting is once again controlled via the stylish Command Center (AlienFX), which can also be used to adjust the power plans (AlienFusion). The third tab (AlienAdrenaline) can be used to select the game mode, monitor the performance or check the status of the Graphics Amplifier. 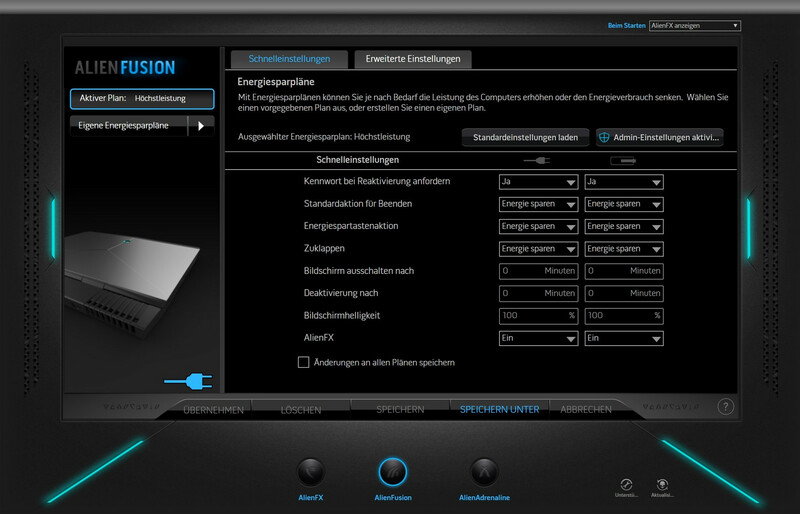 There are also special tools for the touchpad and the sound. 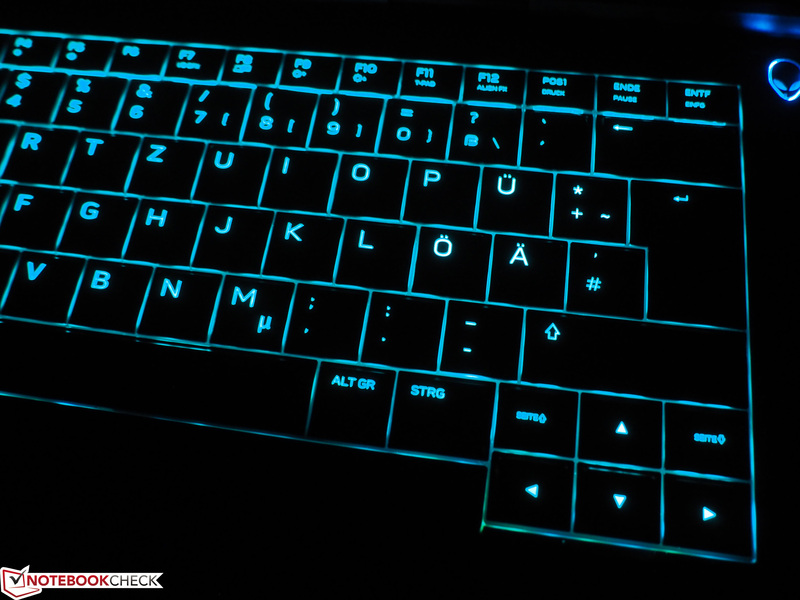 The typing experience across the four zones of the illuminated keyboard is similar to that of the Alienware 15 R3 with the soft feedback. 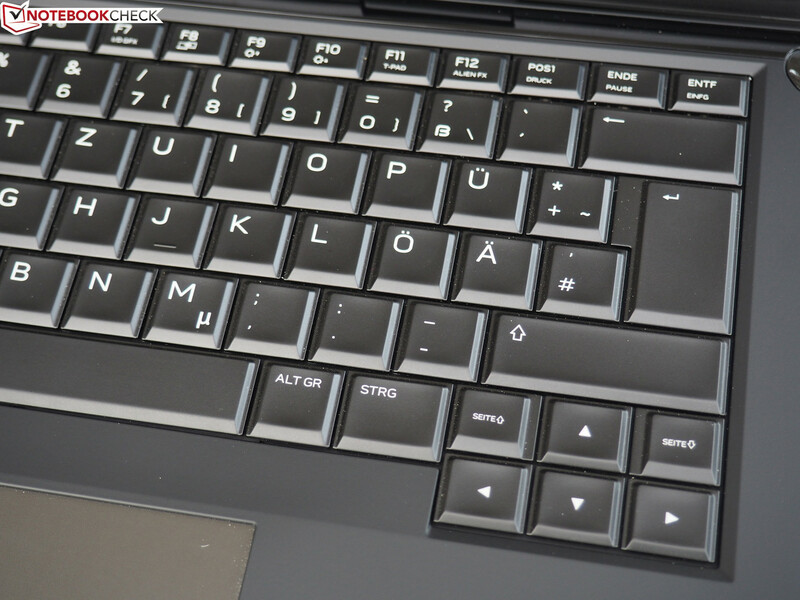 Dell has been able to make the keys very large due the lack of a chiclet design (no spacing). 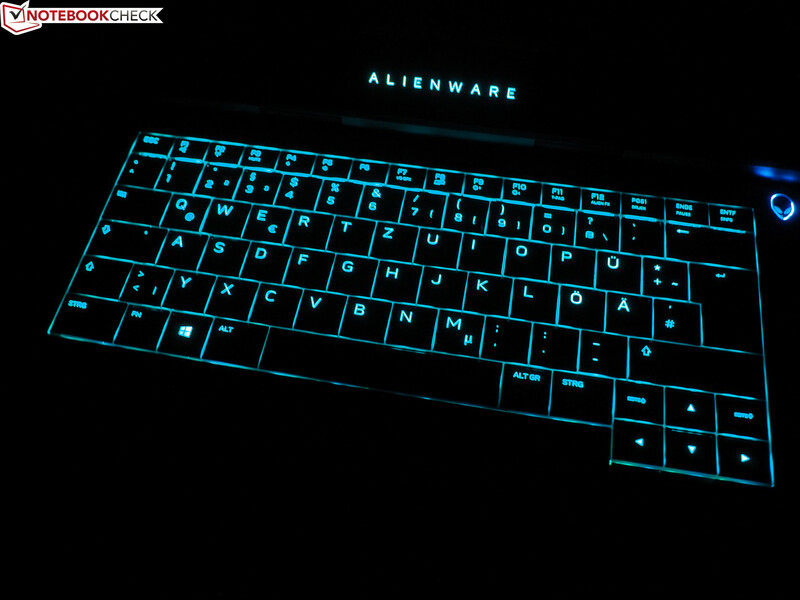 While other gaming notebooks usually have keys with 15 x 15 mm (~0.6 x 0.6), the Alienware 13 R3 keys are 18 x 18 mm (~0.7 x 0.7 in). The typing noise is inconspicuous; it is not too loud, so you can also use the 13-inch system in quieter environments (e. g. libraries). 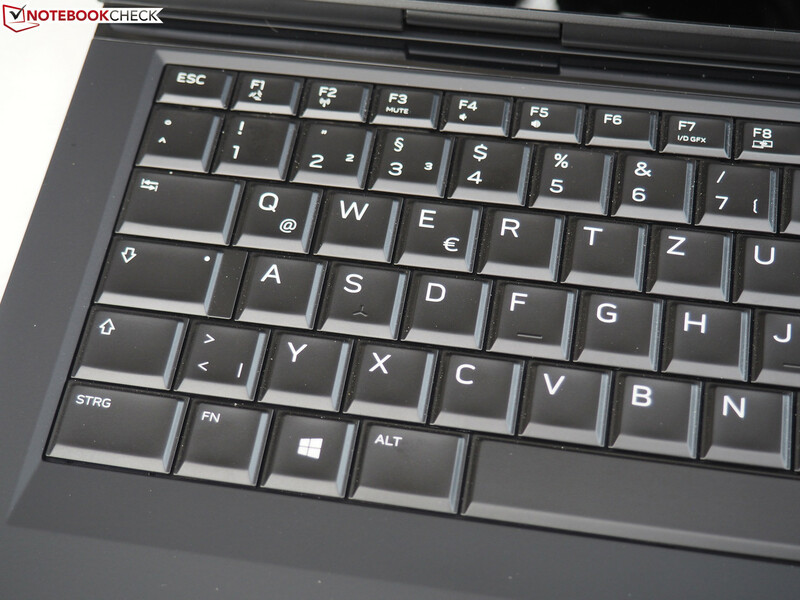 We like the layout and the position of the keyboard much better than the one in the 15-inch version. Dell has not implemented a macro area, so you get used to the input much quicker and do not hit the wrong keys so often. You should also be happy when you play with the (slightly shifted) directional keys instead of WASD. The lettering is big and you can see it very well, even without the illumination – at least during the day. 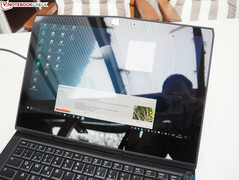 The palm rests are not too small either, which is not a matter of course in a 13-inch notebook. The mouse replacement, which is situated in the center of the palm rests, seems to be identical to that of the Alienware 15 R3. The smooth surface is once again 10 x 5.7 cm (~3.9 x 2.2 in) and has similar gliding capabilities. The touchpad software confirms that gestures with up to four fingers are supported. We did not have any problems with zooming and scrolling (like websites), and inputs are usually executed reliably. The precision of the touchpad is good in general, and the dedicated and comparatively soft mouse buttons (no ClickPad model) work pretty well. 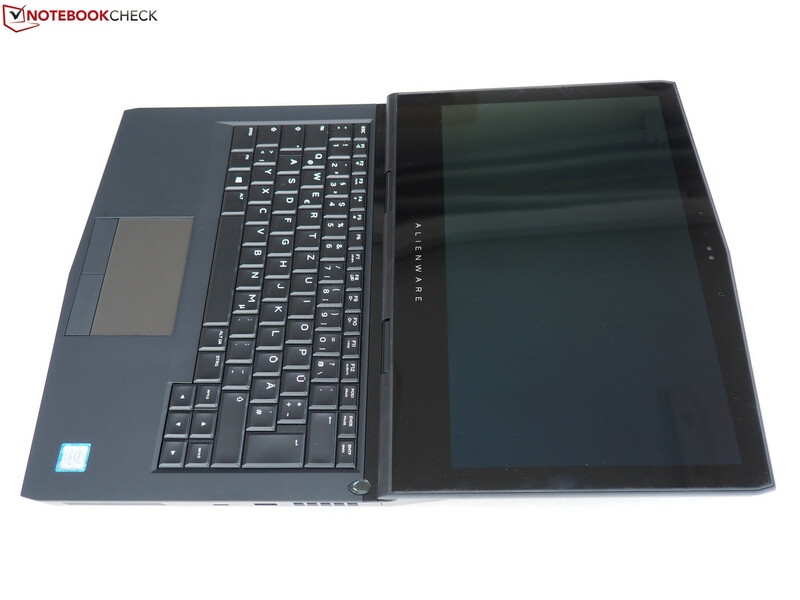 The only thing we would change is the drop; we think the touchpad sits a bit too low in the chassis. One of the Alienware 13 R3's most unique features is the OLED screen. After the TN technology was mostly replaced by IPS panels over the last few years (even though the trend is declining slightly "thanks" to 120 Hz displays), OLED is now the next evolution in the notebook segment. Or should we rather say revolution, because while IPS does not win against TN in all categories (the response times are worse, for example), there are basically only advantages with OLED screens. This starts with the terrific response times, which are so fast that our measurement equipment can only give a rough estimate. 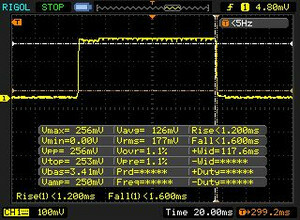 Less than 1.2 ms (rise) and 1.6 ms (fall), respectively, for a switch black-to-black are among the best we have ever determined. 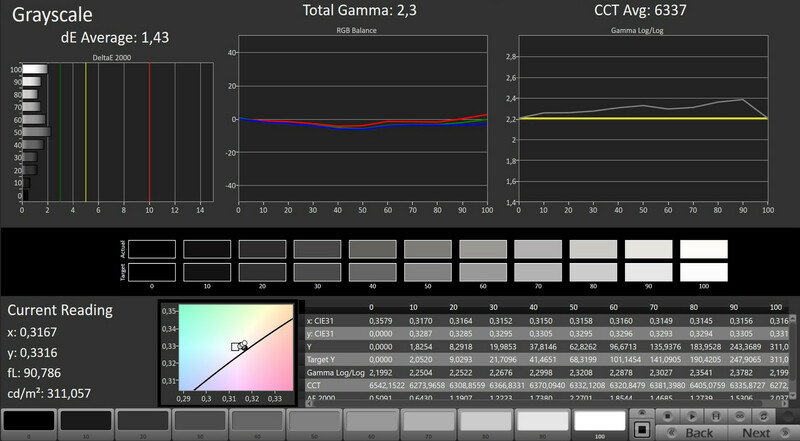 A test grey-to-grey was unfortunately not possible, because the fluctuations were too high due to the flickering (around 240 Hz; one of the few drawbacks of the OLED screen). 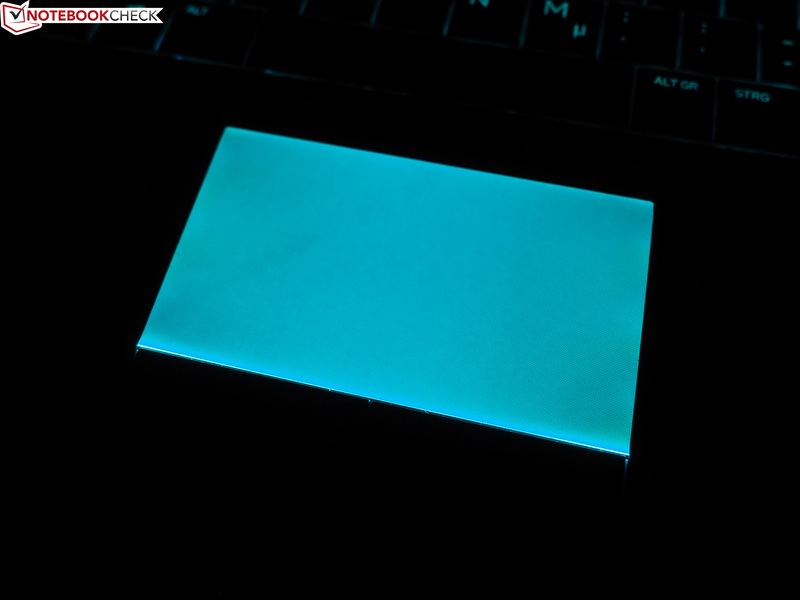 Another problem is the glossy touch surface. Despite the good luminance (310 nits on average), the reflections on the 13.3-inch display (panel-ID SDCA029) are extreme when you use the system outdoors, so you can hardly recognize anything. The reflections can even be an issue indoors. Typical core gamers who do not require touch functionality would be better off with a matte panel. Otherwise, the OLED screen leaves a great impression. A brightness distribution of 87% is not that great on paper, but the picture looks very even and we cannot see any sign of clouding. It is also great that black is really black (0.0 cd/m²; also at the limit of our measurement devices), so in theory the contrast ratio is infinite. 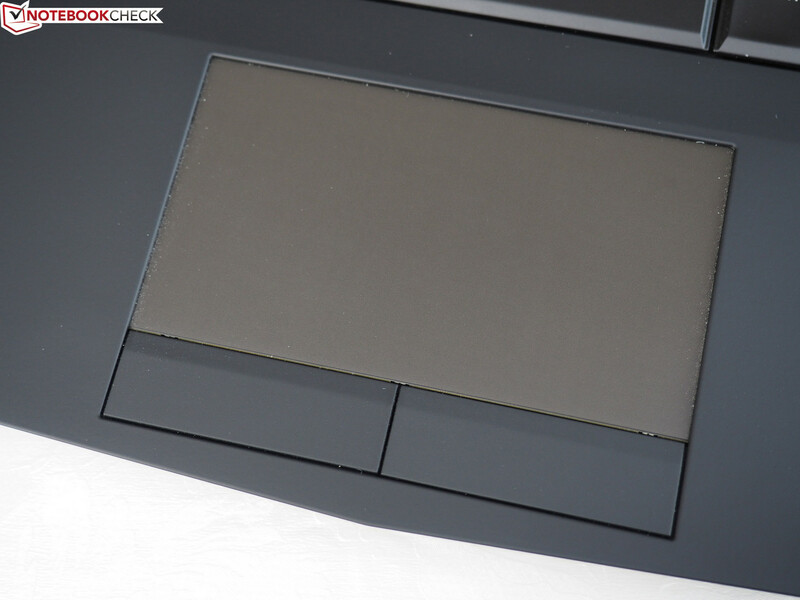 Black contents always look a bit grayish on TN and IPS panels, so you can always differentiate the screen from the bezels. 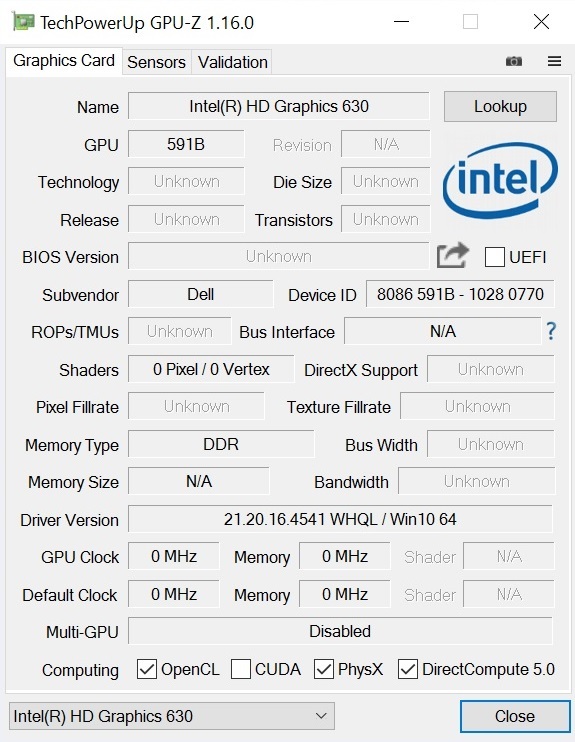 This is not the case on the Alienware 13 R3. If a black background differs a bit from the bezels, it will be a result of the lamination or the colors/lights that create reflections. 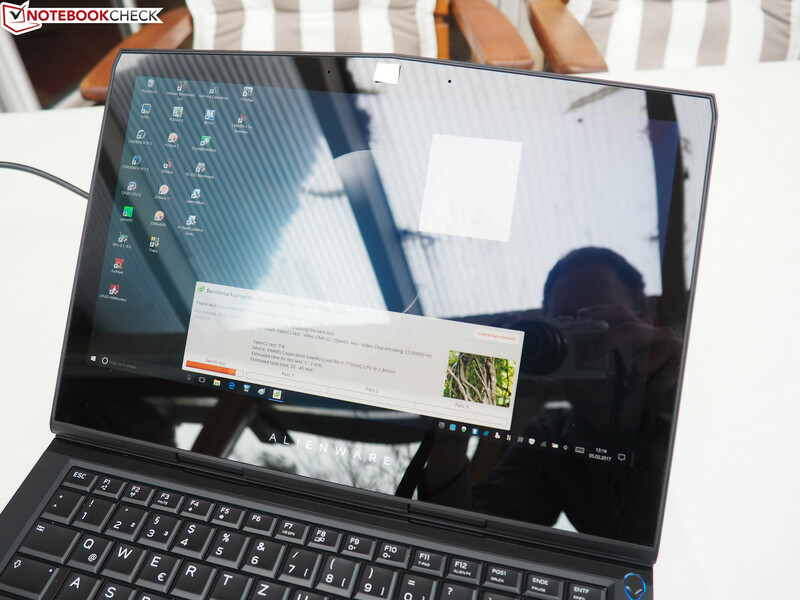 The OLED screen manages a viewing angle stability that is generally unrivalled in the notebook segment. The contents are very natural, even from very extreme angles. Speaking of natural: OLED panels provide a very rich and accurate picture, independent of the glossy surface. This is supported by the results in our CalMAN tests, where the Alienware 13 R3 stays below the target values of 3 (Grayscale & ColorChecker). A calibration is therefore not really necessary. We tried it anyway and the result was an extreme purple cast. The latter is probably a software issue as it also happened in our special article. 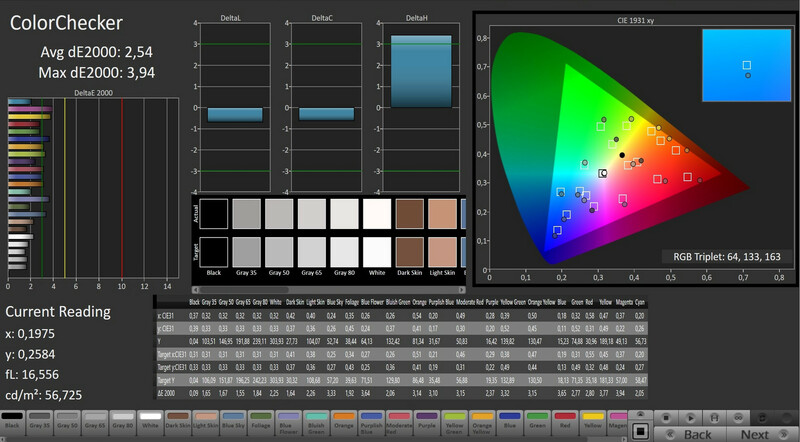 Then there is the color gamut, which also beats most of the rivals. 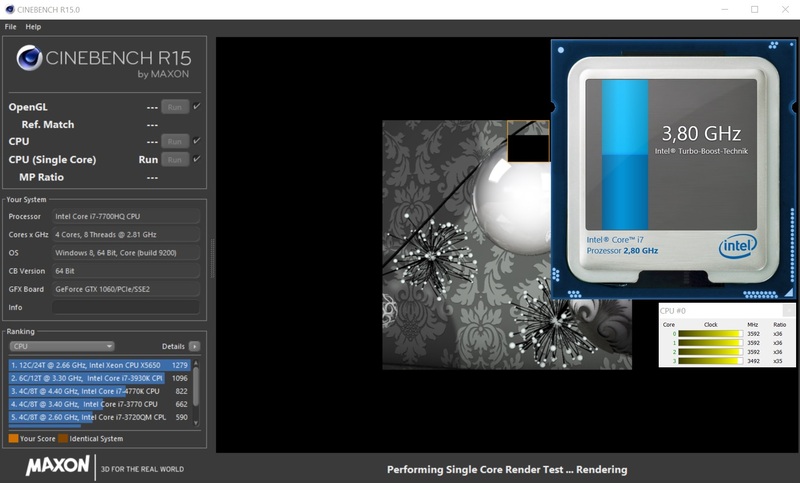 97% sRGB and 78% AdobeRGB are not only interesting for gamers, but also professional users (picture editing). Overall, the upgrade from IPS/TN to OLED feels like the change from an HDD to an SSD: You will never want to go back to the old technology. Whether you can appreciate 2560x1440 pixels with a display size of 33.3 cm (~13 in; 221 PPI) depends on your eyesight. You can also argue about the necessity of an eye-tracking camera (Tobii). Despite the compact dimensions of the Alienware 13 R3, you do not have to forgo high-end components. Processor and graphics card could also be from a 15 or 17-inch laptop. The same applies to 16 GB DDR4 RAM. Dell is not only bold in terms of the display, but also the processor. Squeezing a 45-watt model into a 13-inch chassis deserves respect. Whether the Core i5-7300HQ (2.5 up to 3.5 GHz) or the Core i7-7700HQ (2.8 up to 3.8 GHz) is the better choice depends on the planned usage period and what applications you want to run. 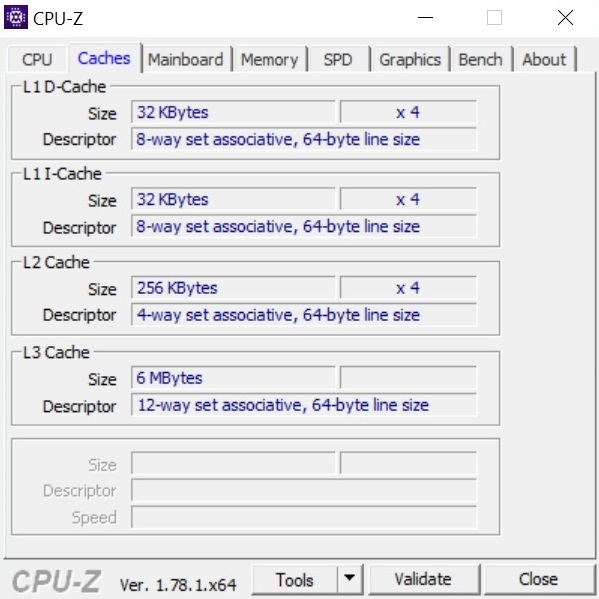 The i7-7700HQ can execute twice as many threads simultaneously (8 vs. 4) thanks to Hyperthreading, which will become more important in the future. However, we should mention that the GPU is the limiting factor in most games. 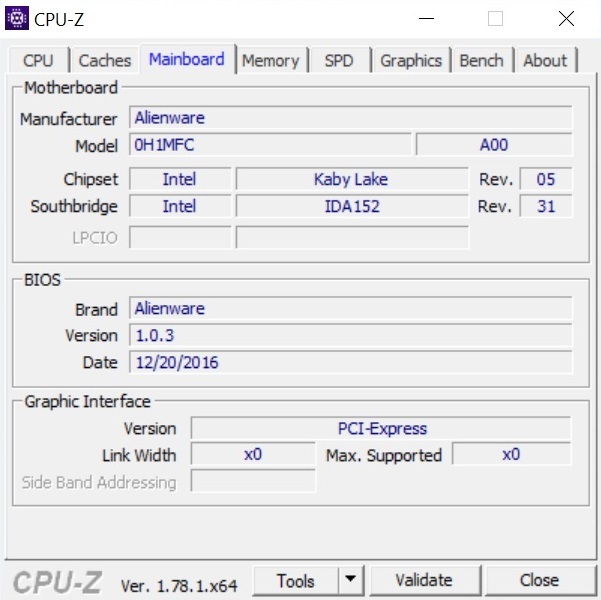 The Core i5-7300HQ will probably be sufficient in the future when you consider the available GPUs for the Alienware 13 R3. We would definitely recommend the i7-7700HQ when you have at least the GeForce GTX 1070 (Alienware 15 R3 & 17 R4). The Kaby Lake chip performs very well in the CPU benchmarks. The Alienware 13 R3 is about 10% faster than the Skylake predecessor Core i7-6700HQ both in Cinebench R15 as well as R11.5. The Turbo Boost range is well-utilized by the system: We can see 3.4 to 3.8 GHz on mains, and the clock will depend on the GPU load on battery power – similar to the Alienware 15 R3. Pure processor benchmarks are still executed with 3.4 to 3.8 GHz by the Core i7-7700HQ, but it will drop to around 2.3 GHz (with fluctuations) in combination with 3D applications. 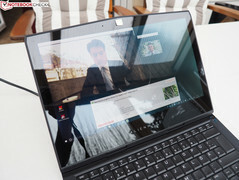 The 13-inch laptop supports Nvidia's Optimus technology, so the system can switch dynamically between the GeForce GPU and the graphics adapter of the processor (HD Graphics 630). However, Dell does not include G-Sync, which would adjust the display refresh rate to the frame rate of the GPU. This is not a surprise though, because Optimus (and therefore power consumption and battery runtime, respectively) is more important than G-Sync on a system with a focus on mobility. The results in the system benchmarks can meet our expectations completely. 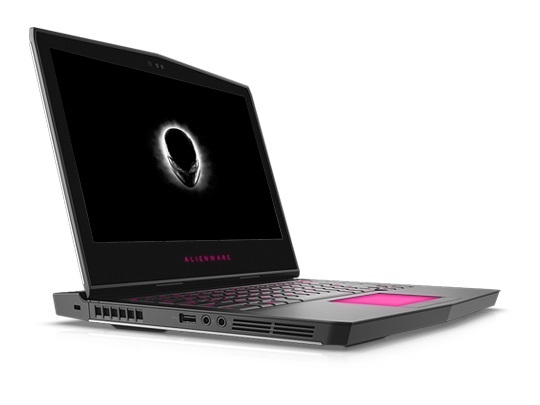 The Alienware 13 R3 is on par with the 14-inch MSI GS43VR (Core i7-6700HQ, GeForce GTX 1060, 1 TB SSD) in PCMark 8. PCMark 7 ranks the 13-inch laptop between the Aorus X3 Plus v5 (i7-6700HQ, GTX 970M, 512 GB SSD) and the Schenker XMG P406 (i7-6700HQ, GTX 970M, 256 GB SSD). The system is very responsive in practice and convinces with very short loading and boot times as well as fast file transfers. The most expensive SKU is equipped with a 256 GB SSD from Toshiba (THNSN5256GPUK) with Windows 10. It is a PCIe/NVMe drive and easily beats SATA-III SSDs. 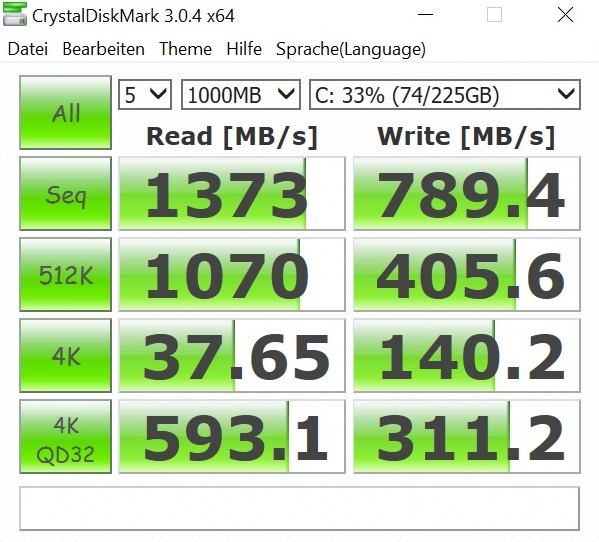 1373 MB/s for sequential read and 789 MB/s for sequential write operations (CrystalDiskMark) cannot keep up with the Samsung SM951 in the Schenker XMG P406 and the Aorus X3 Plus v5, but the Samsung PM951 in the Razer Blade is in bigger trouble. At the bottom of the ranking is the pretty slow SanDisk drive of the MSI GS43VR. 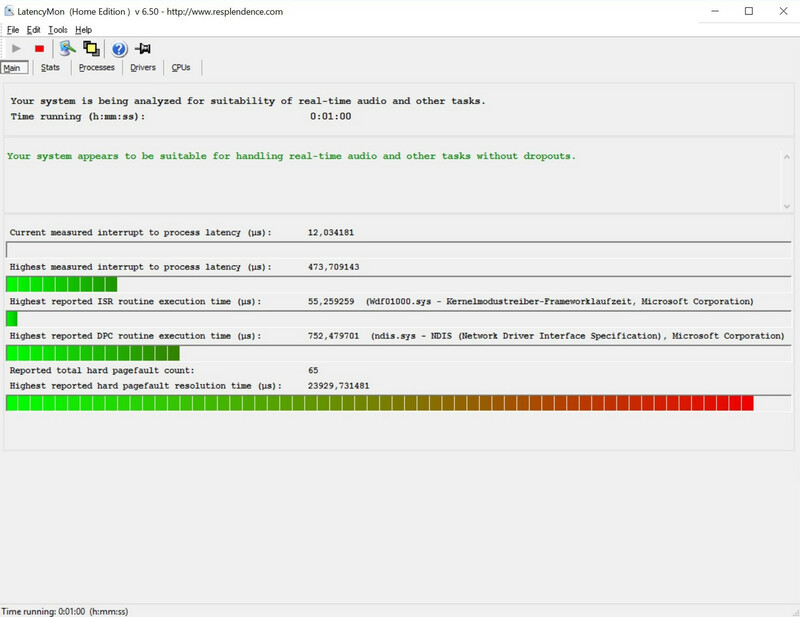 We do not include the AS SSD benchmark results at this point, because the write results (which is often the case for PCIe/NVMe models without special drivers) are not correct. Handy: You also get an empty M.2 slot (2280) if you need more storage capacity. One of the most difficult decisions is the graphics card. While the GeForce GTX 1050 with 2 GB VRAM is designed for casual gamers, gaming enthusiasts should get at least the GeForce GTX 1050 Ti with 4 GB GDDR5 VRAM. We definitely recommend the GeForce GTX 1060 for the QHD display, because 6 GB GDDR5 VRAM is much more future-proof. The DirectX 12 capable high-end model is Nvidia's third-fastest Pascal GPU after the GeForce GTX 1080 and the GeForce GTX 1070. 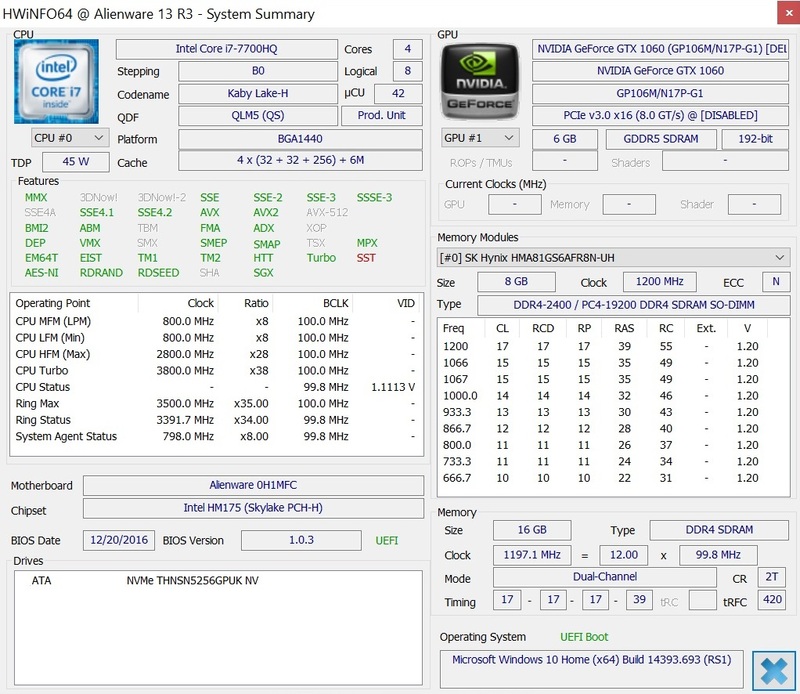 The GeForce models can be automatically overclocked, just like Intel's Core processors. 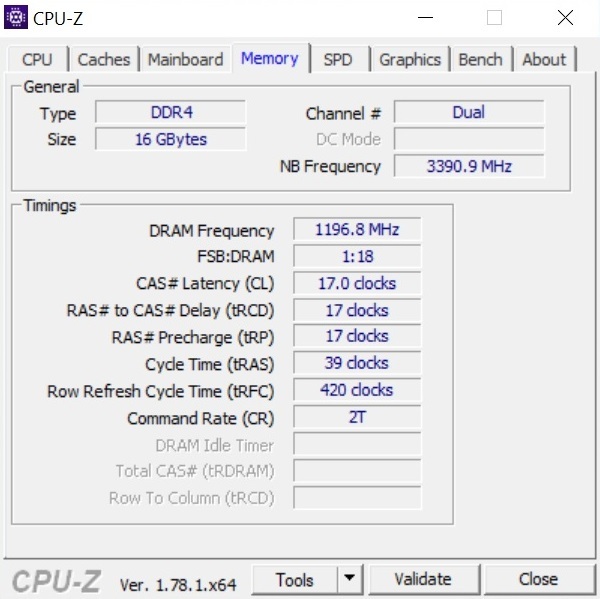 GPU-Z shows a Turbo range between 1405 and 1671 MHz, which is even surpassed on mains (up to 1900 MHz). 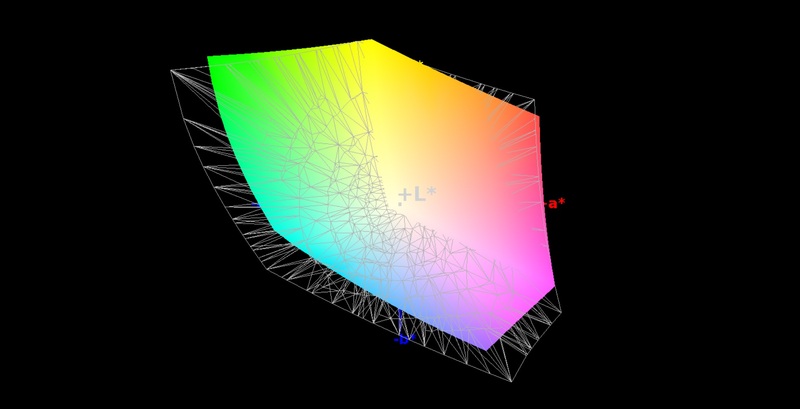 The average clock in 3D applications is between 1550 and 1650 MHz. The latter are results of Unigine Heaven 4.0 and “Battlefield 1”. The core clock drops to around 1200 MHz on battery power, but there are bigger fluctuations. 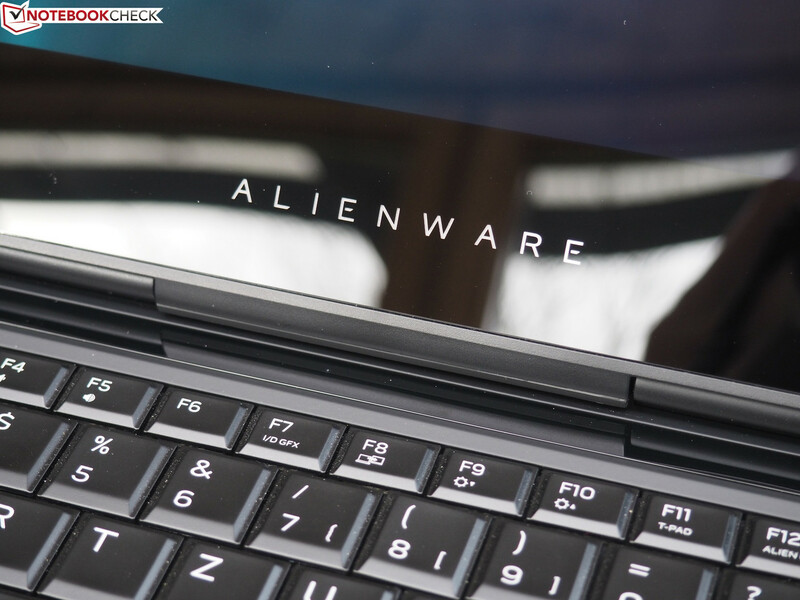 The graphics benchmarks show a good performance level for the Alienware 13 R3. The GPU score is between the Razer Blade and the MSI GS43VR (both GTX 1060) in 3DMark 11 and the 3DMark 13 Fire Strike test. 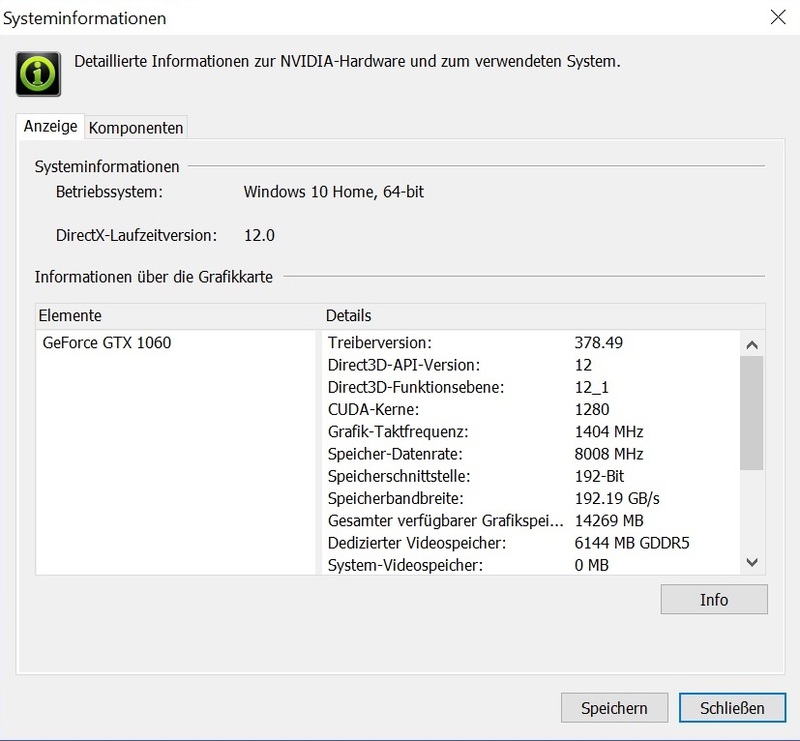 The GeForce GTX 970M of the Schenker XMG P406 and the Aorus X3 Plus v5 is beaten by almost 50%. The GeForce GTX 1060 can handle almost every game at 1920x1080 pixels and high up to maximum details as long as you do not select the highest anti-aliasing settings (see XCOM 2). Many games can even run smoothly in the native QHD resolution. Our benchmark sequence from “Battlefield 1” resulted in an average frame rate of 52 FPS on the Alienware 13 R3 – in the Ultra preset. 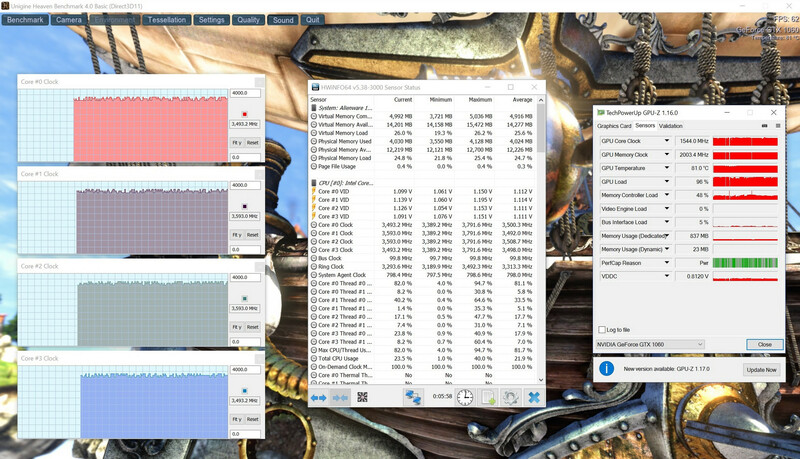 All benchmarks listed below were performed in Full HD with the brand-new GPU driver 378.49 from Nvidia. The noise development is more than acceptable for a small gaming laptop like the Alienware 13 R3. Okay, the fans reach up to 49 dB(A) under maximum load or when you play very challenging games, but this is also the case for thicker 15 and 17-inch systems. The system is usually quieter when you are playing; 3DMark 06, for instance, resulted in ~36 dB(A), which is quieter than on the Razer Blade. Both the Schenker XMG P406 and the MSI GS43VR are much louder when they are stressed (compare table). The cooling solution is very restrained while idling. It is very convenient that the fans are often deactivated with simple workloads such as Office, video playback or web browsing. We could not determine annoying pulsating, especially since the fans will react very slowly on 3D workloads. We were positively surprised by the temperature development after our experiences with the 15-inch sibling. 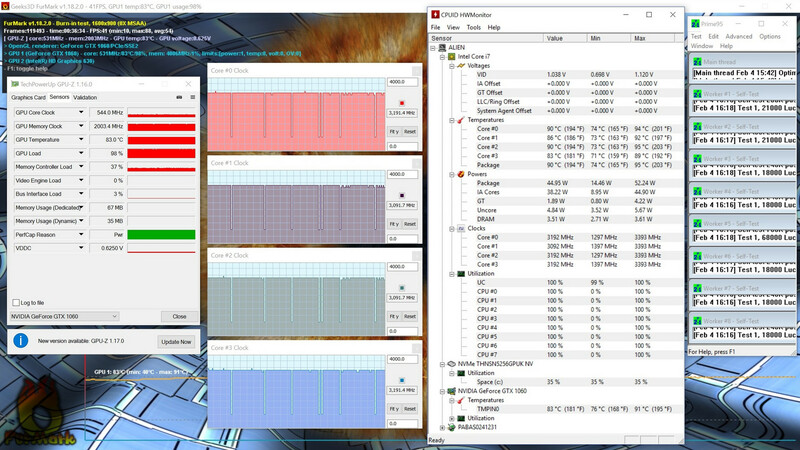 The CPU was not quite as hot in the stress test with the tools FurMark and Prime95 (up to 95 instead of 100 °C/~203 instead of 212 °F), and all cores also reached similar temperatures. 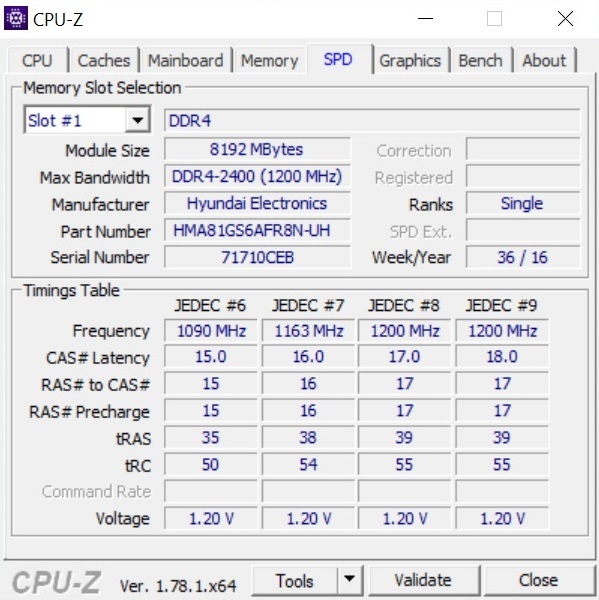 The CPU temperatures of the Alienware 15 R3 fluctuated quite suspiciously. 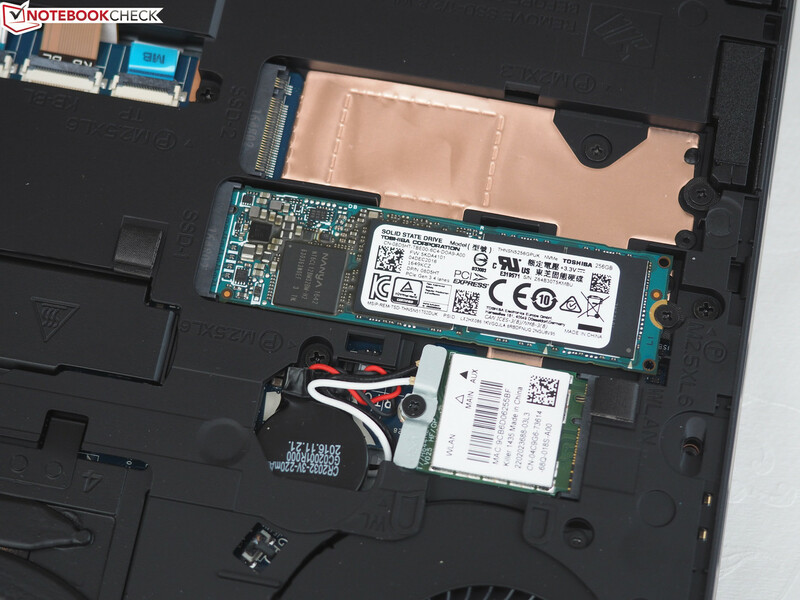 You will get the impression that Dell is having a certain problem with the thermal paste (amount, quality) and the cooling solution in general on all Alienware models for a couple of months now when you browse through several forums. There seem to be big fluctuations between individual devices, so you should probably perform some measurements after the purchase. 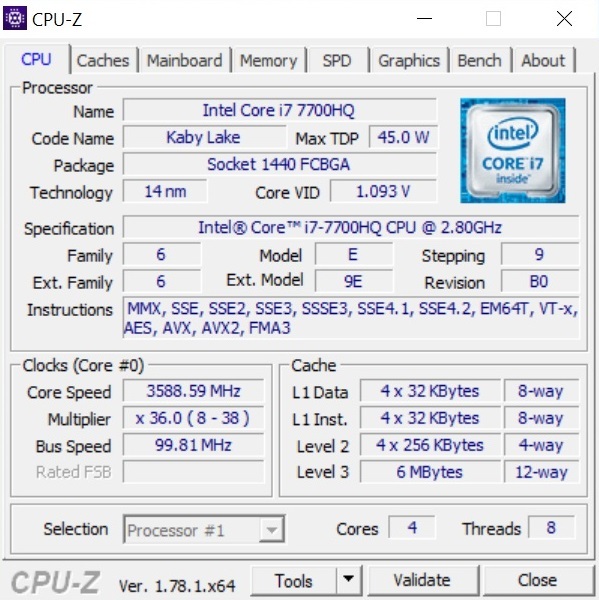 But back to the hardware: The Core i7-7700HQ reaches up to 90 °C (~203 °F), but there is still no throttling if you ignore occasional (very short) drops towards 1 GHz. The situation is not as good for the GeForce GTX 1060, where the core clock drops to 540 MHz over the course of the stress test. 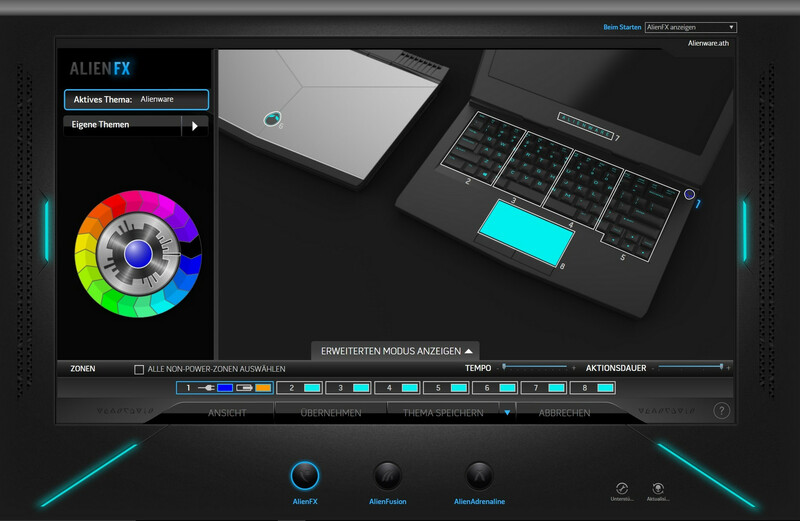 "Normal" 3D scenarios, however, are no problem for the Alienware 13 R3. Neither the CPU (~80 °C/~176 °F), nor the GPU (~86 °C/~187 °F) throttled after 30 minutes “Battlefield 1”. The surface temperatures are mostly inconspicuous. 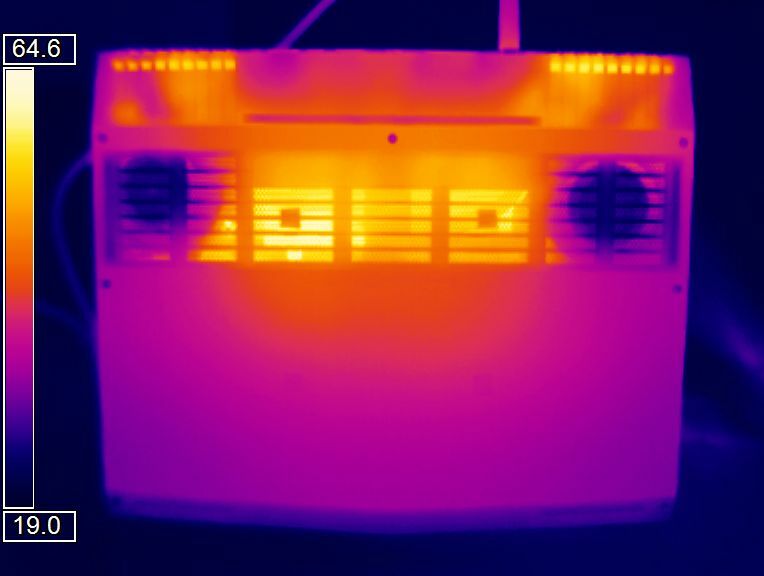 A large part of the chassis stays below 30 °C (~86 °F) while idling, and our stress test resulted in up to 49 °C (~120 °F; top) and 60 °C (~140 °F; bottom) on the 13-inch system. These values appear pretty high at first, but the competition reaches even higher temperatures. Even prolonged gaming sessions are no problem when you do not play with the notebook sitting on your lap. The palm rests are always pretty cool, even with 3D workloads. 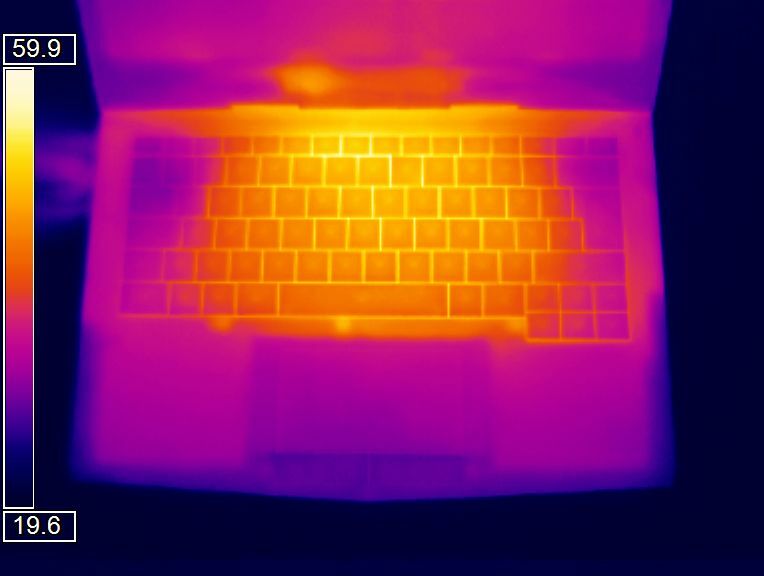 (-) The maximum temperature on the upper side is 48.8 °C / 120 F, compared to the average of 39.3 °C / 103 F, ranging from 21.6 to 68.8 °C for the class Gaming. (-) The average temperature of the palmrest area of similar devices was 28.7 °C / 83.7 F (-5.8 °C / -10.4 F). The sound quality is quite good for a 13-inch notebook. 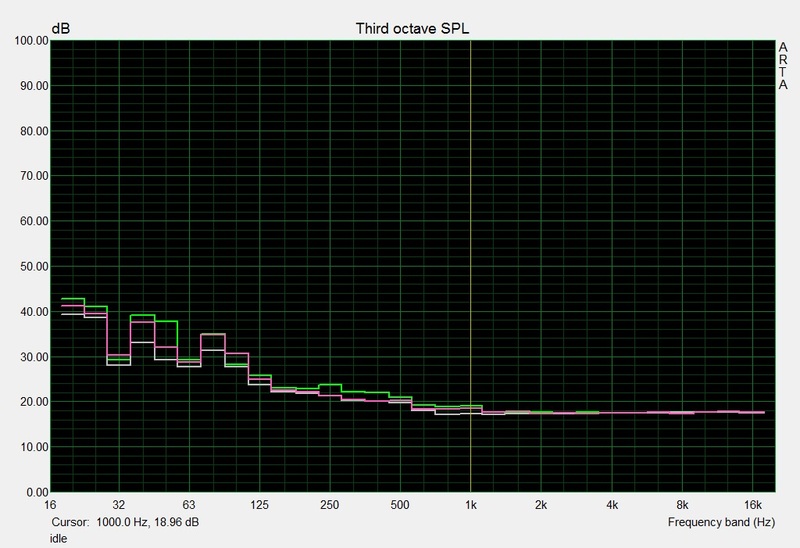 Our audio analysis does not show any red minus symbols for the speakers, which are located at the sides. The mids and high tones are even pretty balanced and linear. Subjectively, the sound quality is decent, and can compete with 15 and 17-inch systems. 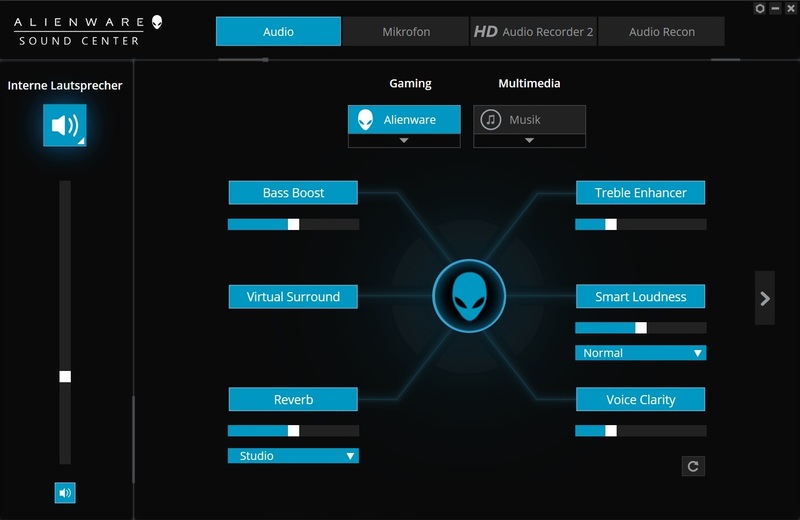 You can also tune the sound a bit via Alienware's Sound Center, which provides several profiles and presets. However, we would still recommend a headset or external speakers when you really want to enjoy music, movies, and games. 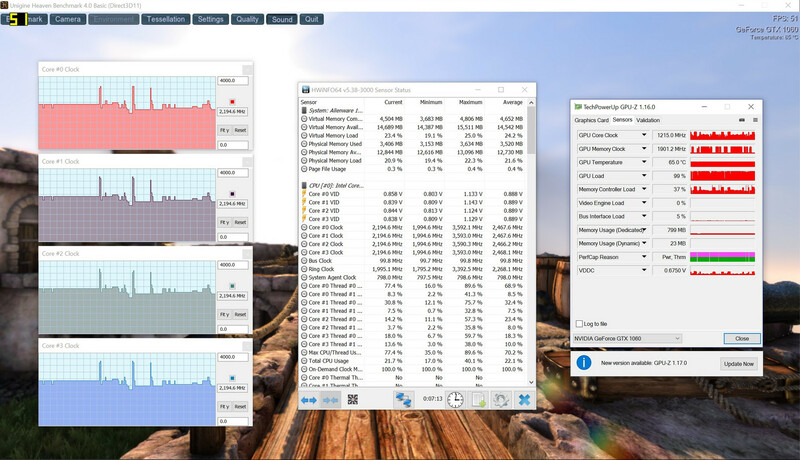 Nvidia's Optimus technology reduces the consumption while idling and when you perform simple tasks, where the Intel GPU is more than sufficient. 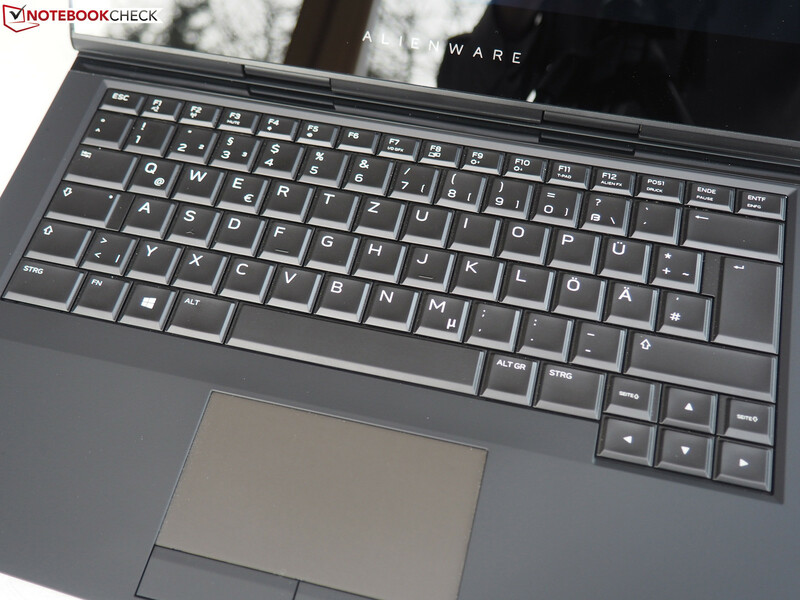 At 7 to 18 watts, the Alienware 13 R3 is even more efficient than the 14-inch competition. 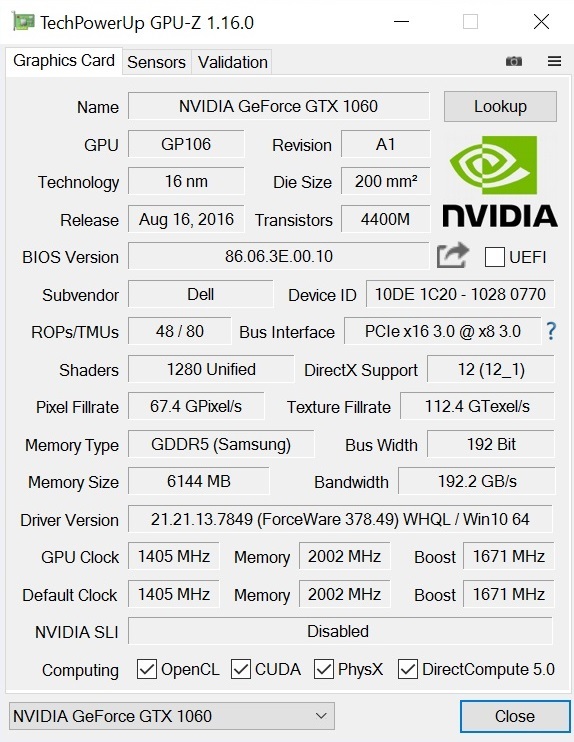 The system will obviously need more power when the GTX 1060 is running. 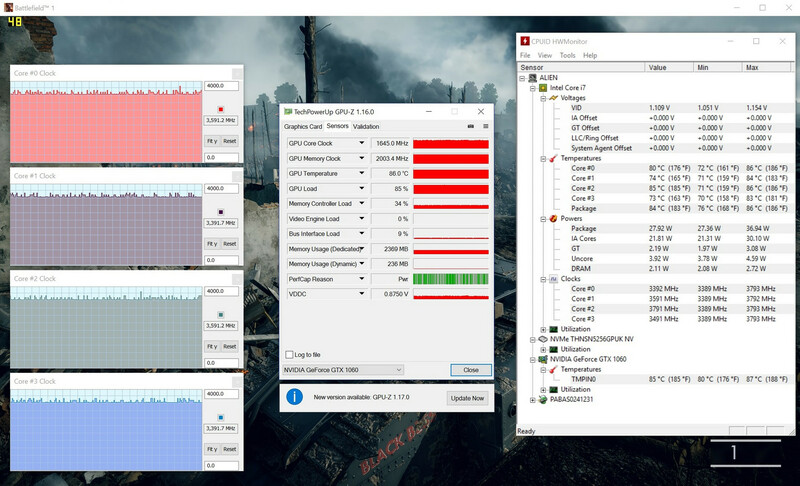 Around 76 watts during 3DMark 06 is on par with the Razer Blade; up to 161 watts in the stress test is similar to the MSI GS43VR. The supplied power adapter has a nominal output of 180 watts and is therefore sufficient. The Alienware 13 R3 can secure the top spot in terms of battery runtimes. Almost 5.5 hours web browsing and ~6 hours HD video playback (luminance adjusted to around 150 nits in each case) is a lot for a gaming notebook. 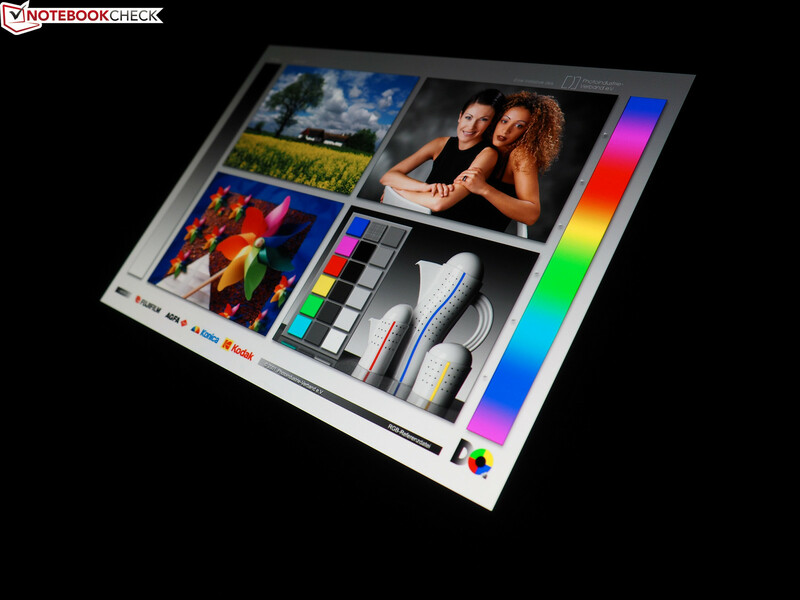 The system even lasts more than 8.5 hours when you do not stress the notebook (at lowest luminance). The system shuts down after ~1 hour under load, which is typical. The battery capacity of 76 Wh is lower compared to the Alienware 15 R3 (99 Wh), but higher than on the other GTX 1060 rivals Razer Blade (70 Wh) and MSI GS43VR (61 Wh). 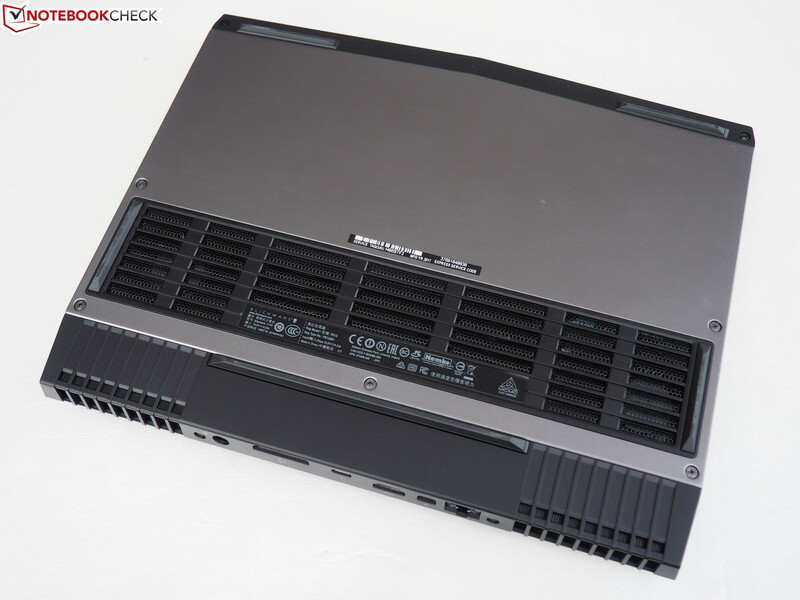 Although the test model of the larger Alienware 15 R3 had problems with the cooling performance (fluctuating and very high CPU temperatures, unnecessary fan pulsating while idling, high noise development under load), the test sample of the more compact 13-inch system did not have any problems. Sure, the Alienware 13 R3 can also be pretty hot and loud in extreme scenarios, but the system is otherwise conveniently quiet and cool. The chassis in particular deserves praise. 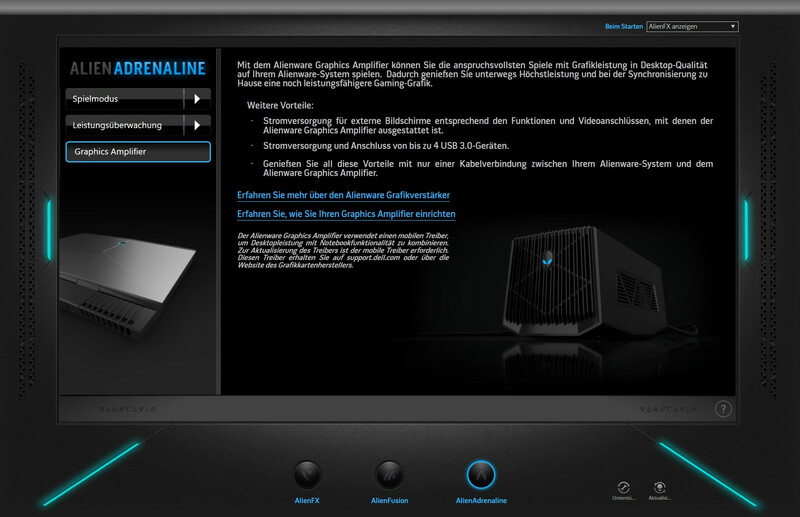 As with old Alienware systems, it is very stylish, sophisticated, stable and well-built. You also get many lighting elements, which make it easy to use in the dark. 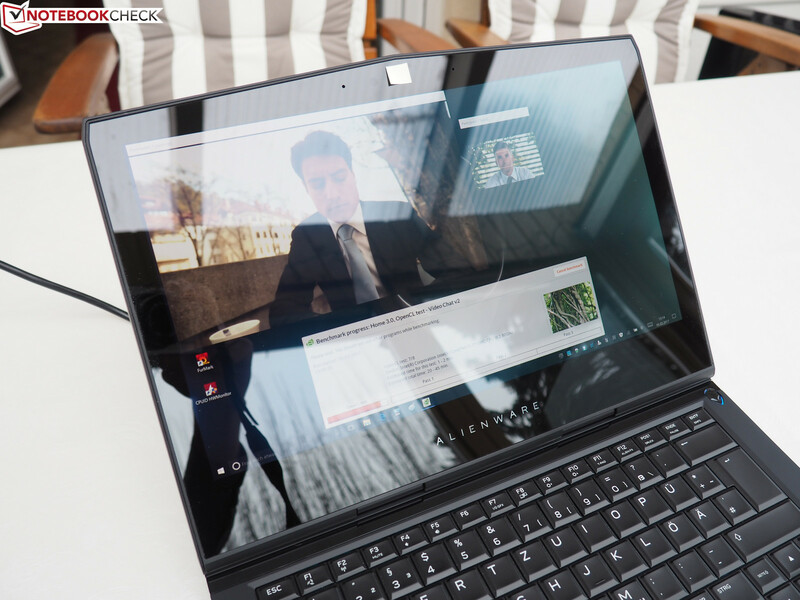 Keyboard and touchpad can also meet the premium expectations for the most part. 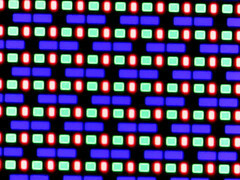 However, the QHD OLED panel (2560x1440 pixels) of the high-end SKU was the most impressive component. 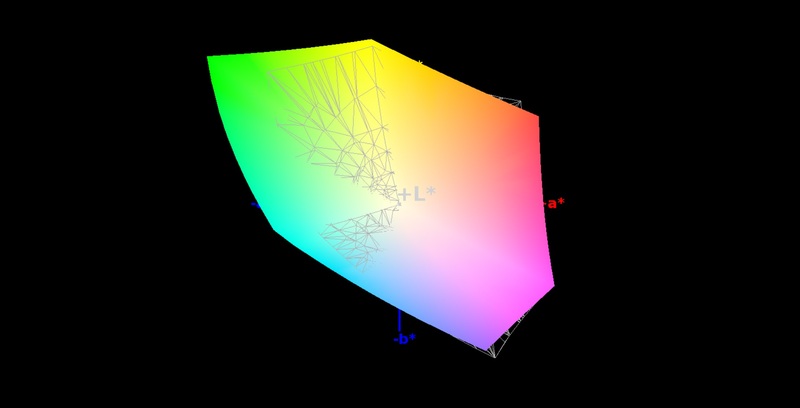 It does not matter if you look at the viewing angles, colors, black value, contrast or response times: Typical TN and IPS panels are beaten in all respects. However, you should know that the glossy surface with touch functionality creates a lot of reflections. The manufacturer has included the latest and greatest hardware currently available. 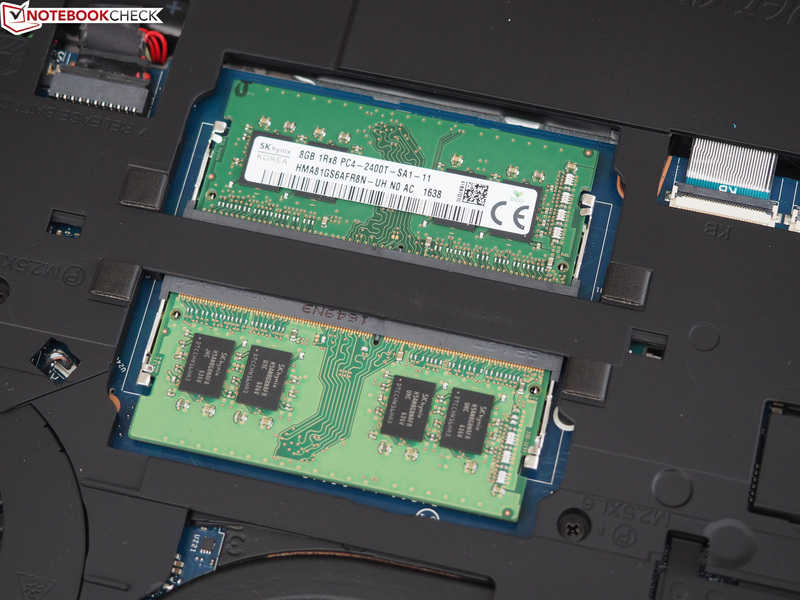 This starts with eye-tacking over the M.2 NVMe-SSD all the way up to the full-fledged Kaby Lake processor in combination with a high-end GPU from Nvidia's Pascal generation: The parent company Dell tries really hard to justify the retail price. Core gamers will only miss G-Sync support and a higher display refresh rate (no 120 Hz option). 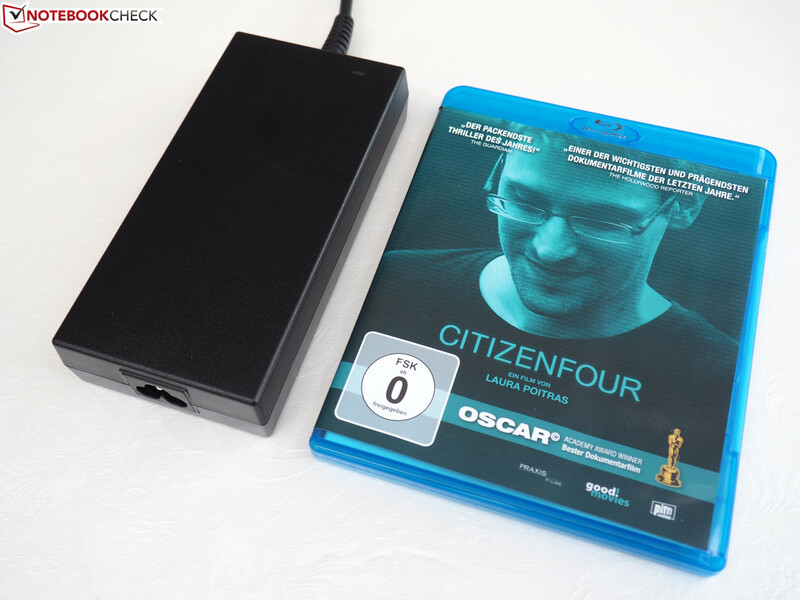 However, you can attach corresponding monitors via HDMI 2.0 and mini-DisplayPort. External graphics solutions are no problem thanks to Thunderbolt 3 and Alienware's Graphics Amplifier either. 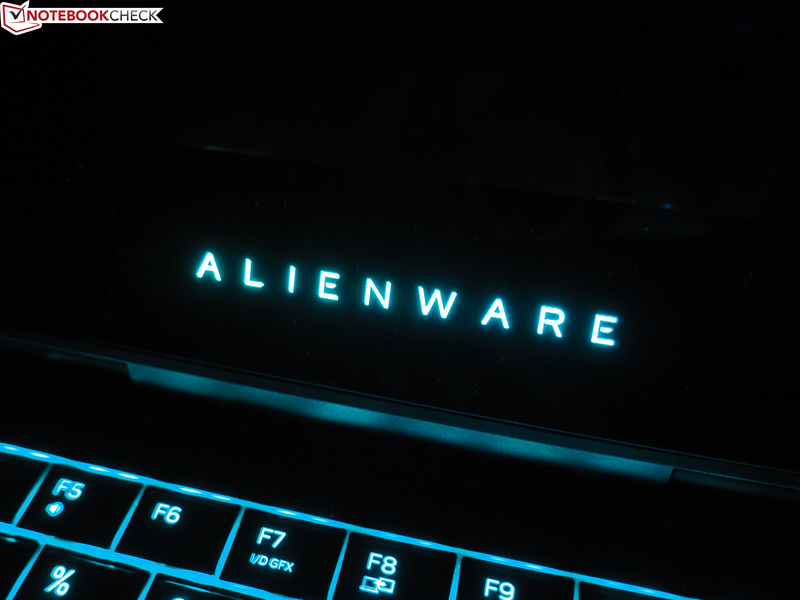 Overall, the Alienware 13 R3 is not only one of the best 13-inch systems on the market, but also one of the best gaming notebooks in general. There are hardly any real problems and points of criticism, so it is by far the best device in our mobile Top 10 ranking. Even the rating of the high-quality Razer Blade is a few points lower (overall rating: 85 instead of 88%).